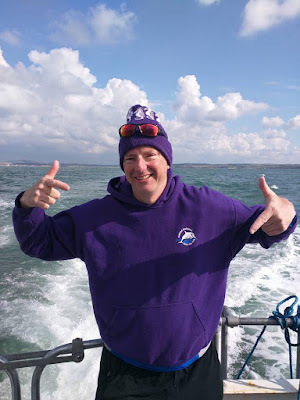 I set myself a tall order (from the idyllic comfort of my desk) at work in January 2015: The 41 mile Arizona SCAR swim, a second English Channel solo washed down with a Catalina Channel solo in California only a month later (not to mention Race director of the BLDSA Champion of Champions and BLDSA 21mile 2-Way Windermere!). The planning of these events is serious fun but much easier than the actual execution! What have I discovered about the Catalina Channel (CC) that I haven't seen written or talked about elsewhere? Temperatures - I decided to go for October as I didn't want it too warm! I was never cold once. The air and water was in the low 70s. Tropical. In fact, you can swim the CC all year round! Make sure you have decent sun screen - I use the blue Coppertone from Wal Mart which is factor 100 but non-greasy so easy to put on without having to rub in for 2 hours - some people use Zinc in addition. Boat Ride - The team was due to rendez-vous at 7.30pm with departure at 8pm. We then had a 2.5 hour boat ride out to Catalina Island. 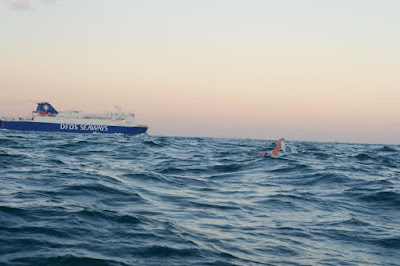 Glad I took my anti-sickness pills and had my last big meal 4 hours before departure as with all the nerves and everything, could have easily seen how you might have started the swim after a serious bout of sea-sickness as there was a bit of swell & rocking. Some of the crew got their heads down in the bunk room and I heard that most swimmers do too - I elected to focus on the horizon as didn't want to start this swim feeling ill. The Start - Involves jumping into the water and swimming to the shore at Doctor's Cove on Catalina Island to then clear the water. For me it was like turning up at a staged movie set. As soon as the boat stopped, there were flying fish coming in from all angles attracted by the glowsticks on the side of the boat. They were then being gobbled up by the plethora of sealions enjoying an easy meal within 2 feet of the boat. It was wild. For them it was like shooting fish in a barrell. Once I jumped in I never saw the sealions again but I did enquire whether they might take some interest in me - negative was the response. They may have been there but it was dark. The water was warm-ish and crystal clear being lit up by Outrider's spotlight. We were in the lee of the land and everything seemed to go completely calm for the start which was very welcome indeed. The Night - I provided the boat crew and team with 10-15 glowsticks that went on Outrider and the kayaks. I put on my LED lights (tube one on trunks and normal goggle one on - the boat crew prefer these put to non-flash - that is done by turning the battery around on both). 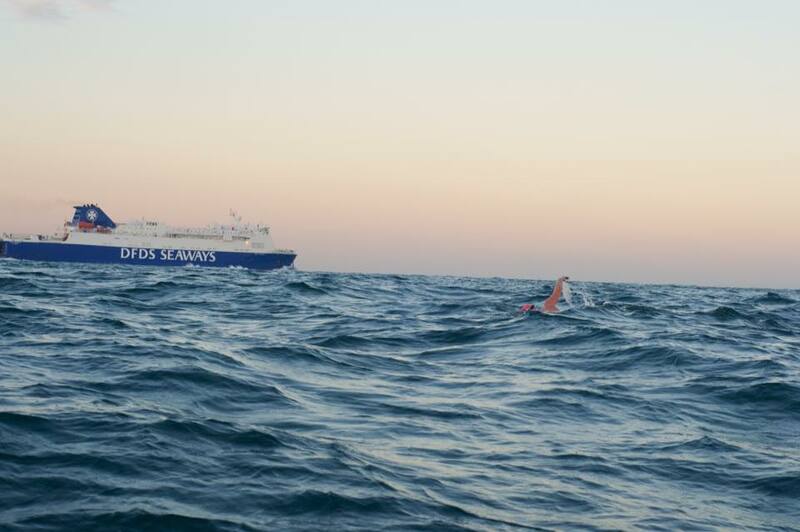 The swim started off around 10.30pm at night which meant ca. 8 hours of swimming before sunrise in the pacific. If you aren't used to nightswimming, it can be mentally very harrowing - I had done an entire night when swimming Loch Lomond in 2012 and 2WW in 2013 so knew this would be tiring. I found the first 4-5 hours very tough as I was still very jetlagged only getting in 48 hours earlier. The whole process was made easier and more magical by the phosphoresence which lit up in the water each time I disturbed the water with each arm entry - hadn't seen this since holidaying in Georgia on the east coast of the USA a few years before! However, annoyingly, after 1 hour the RSI on my wrist started to hurt like mad which served me right for taking on such a long swim within a month of EC2. Ibuprofen began at hour 2...i git stung badly by 2 no-see-em jellyfish in the middle of the night- one on the right cheek of my face and the other down my right arm - they pulled quite a punch and left a few marks which went a few days later - they also seemed to spark up in the night phosphoresensce! Feeds - I had a very simple feeding plan to feed once per hour every hour on the hour. It was mostly the usual maxim mix but I had black tea for feeds 5 and 6 which were welcome. Monica and Audrey managed to rig up both bottles on one reel (feeding at the bow of Outrider to avoid diesel fumes) - one bottle had fluids and the other solids (either jelly babies, banana or fig rolls!). I never found any fruit sugar at the US supermarkets so had to go without. Should have brought some with me! Daylight - Sunrise in the pacific turned up at 6.30am and it was one of the most beautiful & life enriching experiences of my life. Everyone seemed moved & uplifted by it which injected some more energy into proceedings!! Realised I was then swimming in the bluest water I have ever seen. The quality of the water was so pure & whenever I got some in my mouth it didn't make me sick like the aggressive dirtier water of the EC. This also helped the recovery afterwards where tasting food was back to normal almost immediately. Still hadn't seen any wildlife although was certainly looking around for it! The home straight - I hadn't realised how unpredictable and aggressive counter currents are in the Pacific. I could see the finishing beach and lighthouse at Terranea beach for hours and hours. I went hell-for-leather during the swim and had underestimated how much energy it takes to get in to break the current. It isn't always like this and is unpredicatble. Dan frequently referred to this as 'crabbing against the current' which really puzzled me as I wasn't expecting it. I could easily see how someone could get 2 miles offshore and never finish. If it were easy, it wouldn't be worth doing and then more than 350 people would have swum it!! A Sealion decided to join me for the last little leg which was nice and made me certainly feel like the swim was pretty much cracked. The Finish - the 'beach' where the swim was due to land is near the Terranea resort which I had visited the day before. Very rocky with big crashing waves. Terrifying if you are a limping gimp! It took some persistance and holding on to rocks just to exit the water to claim victory. I got a few cuts and scapes for my trouble. 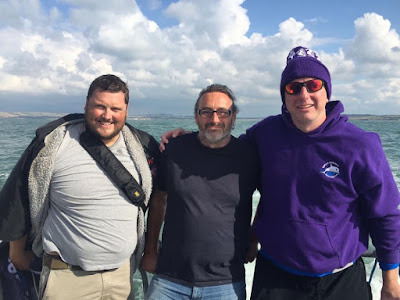 Sharks - I was resonably apprehensive about them before the swim but as usual with shark related news, this is blown out of all proportion by the media who don't have a s0dding clue... I shouldn't have worried so much. We never saw one and I spent most of the swim reminding myself that if Dan S's 14 year old relay team could get in the water then so could I. They have a saying here about the sharks that 'they were there but we just didn't see them'. It remains to be said that no-one has been attacked by a shark in this swim in its history. Think about how many solo's and relays have got across? You have way more chance in getting stung by no-see-em jellyfish that gave me a bit of a kicking twice. I read an article at work that suggested that more people die each year from vending machines and selfies than sharks! - I really wish people would get perspective! The Outrider - is a champion Channel Boat that I'm sure every EC boat captain would love. I kept thinking about how much my English Channel pilot, Neil Streeter, would welcome the chance to see this!! John Pittman had a team of 3 crew who had snacks on board and looked after my crew even cooking them breakfast buritos! They even have a massive bunk room so your crew can get their heads down to the start of or during the swim. In America, they seem to do certain things just bigger and better. This is prime example thereof. There was even a flat screen TV in the cabin detailing my progress on the map! Conclusions - Is this a tough swim? Yes - you still have to be able to swim >20 miles and there is a qualifier to weed out those underestimating the challenge that lies ahead - the water is lush and warm. It's a magical experience being able to look at land from swimming in the Pacific - an experience I would never thought I would have as a lad. I would certainly recommend this swim to any of my Nemes Nutter mates or anyone who has the desire to push their boundaries beyond a 10 miler... Is it as tough as the EC? No. I finished this swim in 12 hours 22 mins. My ECs took 14hrs 33 and 13hrs 32 which says it all really. It was an awesome experience and I am really glad I took the trouble to follow through with this swim. Please get in touch if you need more intel? Hope you get something out of it that might prevent you from making some of my errors! 1. Jumping in the water at Samphire Hoe is a great deal warmer (I would consider tropical) in September than at the beginning of July. If I do this swim again, the first week of September would be my choice. I won't worry again whether it is a neap or a spring as only swum on springs! 2. The first 4 hours in the dark were VERY tough mentally (I had been up since 5am the previous day & had a full day of work in the city). This bit was mentally far tougher than the first swim and certainly opened up the doubt devil in my mind & could have opened the door of failure. (Some warned me that the 2nd swim is harder). I took a great pride in not complaining to the crew but Ade said I looked completely miserable during this time! I would beg to differ - I had just not reached my full potential. 3. I used a clear pair of goggles (for night swimming) that I wasn't 100% sure that were leak-proof. In reality they weren't and my eyes were agony - couldn't see much of the boat and should have known better. This made some of the swim quite miserable which should have been entirely avoidable. I was desperate for daylight to switch the goggles over which made life become gradually better! 5. The last swim was a 6.8m tide and this being a 7.2m didn't phase me - my overall time was 1 hour faster (13hrs 32mins). I swam a total of 64.8km including tide and even moved 500m in under 3 minutes being hurled round the cap! That's a record for me! 6. Funnily enough, it took me quite a while to remember why I really wanted to be there (!) for motivation (I need something more profound than 'because it's there'!). As soon as I uncovered/unlocked that motive, the whole escapade became more focussed - the aim I began to realise was to put my name amongst the ca. 180 who could boast a 2-time Channel - so wanted to be a member of that exclusive club versus the 1600 who had only done a single solo. Glad I eventually worked that out! 7a. I was glad to only have 2 crew (other than the Suva boat crew) to help with feeds. 4 crew-members seems too many last time and meant more people (AND kit) to worry about. 2 is ideal and aided by the fact that Suva has superstar crew ace Sam Jones up their sleeve. Ade (Adrian Rotchell) was on the rail the whole time (got no sleep) and Richard (my brother) was called at 2 hours notice to take a day's leave > both guys are incredible with their generosity & kindness. 8. I only fed 1x per hour and the crew ensured that got faster and faster. I had no time to dwell on trying to chew a jelly baby and observe my progress - I had to chew these things whilst moving! It wasn't a rest, it was a feed - I was grateful for that the other side when the tide turned. They just passed me a single plastic cup which I drank in 10 secs then threw back on the boat. Again, I barely wanted any solids as felt like I wouldn't stomach them given all the salt water being consumed whilst swimming. The odd banana, jelly baby or bit of milky way was all I managed. 8. I still like my maxim mixture with summer fruits and fruit sugar. Some of them were double x double strength (you read that right). Every 5th feed was black tea with fruit sugar. That was a winner and I should have done that the 1st swim. Ade swears by just having warm water during his long swims > I'll leave that feeding plan with him! 9. Didn't panic when in the separation zone and had to swim through mountain of jellyfish. I got stung umpteen times including on the tip of the left rotator cuff which was really miserable but the best cure for that was obviously cold salty water! 10. France never gets closer. Remembered to block out of mind and look at the boat & swim feed to feed. Didn't wear watch & tried to avoid looking at France so that saved a double-rollocking off Neil! 11. After 10 hours of swimming I was urged by the pilot to sprint for 1 hour - I didn't swear at him other than in my head! Glad I had something left in the tank to do that. After 12 hours of swimming, they asked for another burst. Amazing what you can achieve when the prize is there for the taking. 12. The tides round the cap are breathtaking on a spring but nothing to fear once you get into the eddy the other side. I remember before attempting Loch Lomond, my mate Gez Lyon said to me - 'If you can put one arm in front of the other, you can keep going'. I said that to myself over 1000 times and you get there eventually if you can stop the wheels from coming off! You can also wee whilst swimming if you go slower and don't kick your legs. 14. I still enjoy 2 cans of full-fat tango on the boat on the way back and I didn't get sick! 15. I was thankful for doing so much technique work - especially working on putting some power into the back of my stroke all the way past the thigh. Mark and Lucinda Bayliss had picked up on that in my stroke in April in our training in Lanzarote. I was also thankful of all the interval work in the pool during the winter with the Nemes Nutters. 17. When you finish the swim and open up social media, you realise the whole world has been going mental trying to urge you on! Including ca. 100 work colleagues who watched the tracker all day! You then indulge in what I would term 'social-media-heroin' for a while which is quite a buzz. 18a. You can get on the early train back to work the next day (5.49am!) as you are still on cloud nine and ready to bask in the glory. Some of your colleagues will be very willing to take you out to a slap-up lunch! 18b. Ben & Jerry's Fish Food Ice Cream still wins hands-down for easing salt-water mouth and re-addresses calorie shortfall quickly. 19. Your colleagues still like to be appreciated with Lola's Cupcakes! 20. Getting out of a deep bath with a sore body & little use of left leg is a real bugger! Having no radox bath salt is also a massive let-down! Wow. I feel so eternally grateful to have got into this sport, for the people I have met on the journey plus the complete bonus of the places I have been unswervingly drawn to. Without open water marathon swimming and seeing a good coach for an effortless stroke coupled with knowing (who I consider to be) the best British Long Distance Kayaker , Pete Fellows, I would never have been in Arizona. This blog feels slightly redundant I am afraid as sadly the photos plus my rhetoric REALLY CANNOT do the whole experience justice. I will endeavour to try and enlighten though. One year in the planning > 4 days in the execution!! 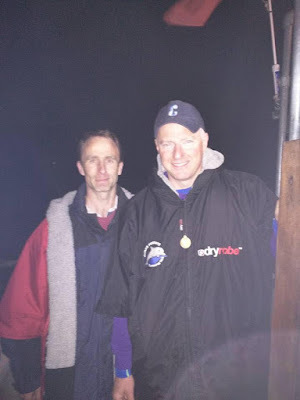 This event was in the planning for well over 12 months and already had 1 week with family in the Tonto National Park area to understand what I was letting myself in for in April 2014 whilst training for my successful English Channel July 2014 attempt. The application process opened around the 1st November 2014 and closed in a short 36 hours (thank god I bothered to wrestle with the wifi in the Holiday Inn in Le Touquet when I was showing the girls where I landed my channel swim). You do not register, you apply....there is a difference! SCAR....what is it? 4 letters that conveniently represent the first letter of each lake swum in order. Saguaro, Canyon, Apache and Roosevelt. Billed at 9.5 miles, 9 miles, 17 miles then 6 miles. Swimming from buoy line dam to dam on the Salt River system which represents 41 miles of open water swimming in what could easily be considered as some of the greatest views and fresh water on earth. Simples then? Cue the Meerkat? Err No. Only 27 people out of 47 (57%) evidently completed the entire event from beginning of S to end of R.
Everything kicked off on Tues 5th May in the evening for a dinner at the tranquil sun-drenched terraces of Mesa Country Club overlooking the golf course. How civilised and lush....The calm before the storm perhaps...There was a banquet of scrumptious Mexican buffet-style meal which certainly facilitated introductions, much chatting about mutual friends (Kelly who had been working in Croatia with my mate Sian Williams) and catching up with swimmers met before (Helen from Oz who I met at 1WW in 2014 and Matthew Hills from the UK only 30mins down the road) and everyone was required to stand up to flag/brag about their forthcoming next challenge ahead. I bored people senseless about forthcoming EC and Catalina Channel. We were sitting next to Cole and his friendly parents from Texas - Cole was set to absolutely blow the rest of the field away BLDSA Tom Robbo style over the next 4 days!! The scene was superbly relaxed where some live music set the tone with great music from Chad Gregory (that man can play n' sing) and an introduction from Kent Nicholas (organiser and mastermind). There were some seriously tasty swimmers here (most faster than yours truly) but you could sense an underlying nervousness talking about and committing to forthcoming challenges with SCAR (all 41 miles of it) still on the table! If you think below is some reasonably extreme mileage then spare a awe-inducing thought for the incredible Liz Fry who did double each lake!! Yes 82 miles in 4 days training towards a triple channel. Huge respect and congratulations on her achievement. She got a small American flag to fix onto her car as a prize - priceless! Just remember being nervous as hell. We made our way via two boat shuttles to the buoy line near Canyon Dam where the Saguaro swim was due to start. I felt like I had suddenly sunk inside myself and my quiet mental space had been invaded by some aliens > I had 41 miles ahead of me, to put all that relentless distance into the shoulders, concerns about the pain and whether my training had been enough. Would my shoulders hold up? Would the pain level off? Would I fall over and hurt myself? I had been in this space before but that doesn't make it easy. The hardest thing in England was finding warm enough water to train in over the Winter which meant utilising Charlton Lido with Ade, Mikey, Graeme, Sam, Vicky, G and the Charlton Lido Nutters helping us to get through 6km sets every Saturday. That felt tough but 6km weekly preparation for a 41 mile 4 days? Boy, that seemed wholly inadequate! Thank god we had put loads of ice in the cooler and each feed (on the hour) was met with some relief. The views were simply spectacular (canyons, cacti and various forms of wildlife) and I found a sensible rhythm but was excited and wanted to give it some beans. 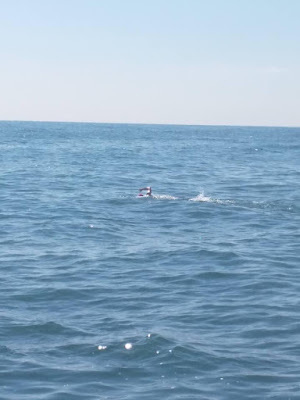 We gradually overtook 2 of the other wave 2 swimmers and some of the wave 1 swimmers who were set off before us which lifted the spirits materially but of course this wasn't billed as a race per se. Pete saw a bald eagle swoop down and catch a fish outta the water and head back to its nest. WOW MOMENT. He was blown away to witness something hardly seen by even the oldest of the Tonto National Park Rangers. He grinned from ear-to-ear the whole way like he was paddling through kayaker-paradise which also lifted me materially. We passed the iconic Ships rock rounded a bend and then could see the end of the lake with boats. Reminded me of the BLDSA Lake Bala in Wales event with an end that never comes any closer. We ploughed on, I got my head down and eventually (another 2 miles later) rounded the final bend into the buoy-line which I had to touch to finish. Heavily-anticipated as the prettiest lake. Seems like all the swimmers and crew concurred 100% afterwards. Same rig - in Wave 2 (out of 3), started at the buoy line and was left at the rear (again)!!!! I hurt my neck during the course of the swim just looking up at the canyon walls, the sheer breathtaking beauty counterbalancing the neck agony for the rest of the swim! This is one of my favourite photos from the whole trip. Pete saw a Big-Horn Sheep which I missed but silhouetted beautifully at the top of a cliff. The plan was to take it very smoothly as we knew full well we wanted to ensure we would make the start line in reasonable form for the 17 mile Apache lake the next day. I cruised into the finish line in 4hours 22 which wasn't rapid but didn't feel as wasted as the day before in Saguaro. The group all then seemed to start to bond more as we all drove to Apache lake via the Apache Trail (which is long dirt road with NO tarmac) & Tortilla Flat restaurant and checked into the Apache Lake Resort. I had booked us a suite way in advance and was expecting something reasonably plush (with a view) but what we found was something where time stood still in about 1960 (but still had a nice view of what lay ahead for the next day). It gave me a perfect juncture to rib Pete about his double bed that looked like it had been used for major gymnastics in a recent honeymoon (the least said about the sheets the better!) - we had a right old giggle about that which took the edge off any worry about the next day so we slept well and both must have snored the roof off....talk about sounds of the Serengeti! The logistics on this lake must have made this a nightmare for Kent and the superstar boat crews. Our boat on the way to the staging beach lost its prop to the bottom of the lake, another boat ran out of fuel...murphy's law was working good and proper it appeared. I managed to get Pete a good kayak with a black back support and he was happy as Larry given the potential for ca. 10 hours ahead needing to be comfortable as possible. The swimmers boated to the start-line and it was 9am. I knew that to get this done without getting pulled I would have to pull my speedo's up and get to the other end in 10 hours as it would be getting dark. The first 3-4 miles were a complete breeze swimming in turquoise water past a little island, a beach and 3-mile wash where we had hung out a few days previously. Then we turned a corner and Windermere-esque the main middle third of the lake opened up in front of us. We could see for miles. I deliberately looked only to the side breathing & at Pete or the scenery & got my head down to graft. Gradually Mark 'one-speed' Sheridan picked off a few swimmers who had gone off in the earlier wave or were entirely unfamiliar in the distance. The wind started to pick up to 15mph and it was becoming slightly uncomfortable. We gradually inched our way until the Apache Resort was in sight where we were told we would be 60% done. The wind was now 20mph as we passed the Apache Marina which I knew we would be able to see for hours to come as it looks up most of the final reach. We 'hugged' the cliffs on the north side which made the swim very special as some of the overhangs looked like faces. Swimming under the rocks with some fault-lines visible also gave Pete a cause for concern (would they give way?) but for me the water was so pure & clear with huge boulders underneath me which reminded me of Wastwater (my favourite place to swim in the UK). We rounded the corner into the final 30% and the wind was now absolutely FULL ON, well over 25mph & gusting way more being funnelled by the canyon. We later learned that loads of swimmers and kayakers had retired in this very spot as they dared to peer round the corner. I joked to Pete that we were lucky that it at least wasn't windy and he responded 'Shezza's here for Apache' and he was obviously relishing the challenge of having to paddle hard for once rather than being on the Arizona SCAR lakes & Tonto National Park sightseeing tour with a slow limping gimp for company. We crossed over the lake into the teeth of this wind and at the time it felt like I was in a proper all-out war - I was secretly glad that this lake was going to be no 'gimmie'. A couple of waves hit my shoulders so hard it ripped my arm from taking any stroke and hurt like hell. I shouted into the water to keep the pain to myself and not to worry my kayaker. However, in this funnelled cauldron of wind was actually some of the most beautiful part of the lake with what Pete knew as the painted cliffs and a really cool single rock sticking up and showing the way like a lighthouse. It was dramatic stuff. We turned half left round a corner and I then got told I had just over 1.3 miles to go. Where did that suddenly come from? We had a pact that I would never ask how much further to go and Pete maintained he wouldn't tell me anyway. I knew I would get it done in daylight and broken the back of the whole SCAR event. The feeling of achievement was heavenly. We got closer to the dam and I thought it looked like something off the WW2 dam-buster films in the darker light. The feeling of elation touching the buoy line after 9hours 32 mins and 17 miles of swimming evidenced a feeling of united strength between kayaker and swimmer like few other swims I've been on. I smacked the water for 30 seconds like I did at 2swim4life 2 years previously. We later found out that fewer than a 1/3 of the original kayakers actually made it all the way to the end. Felt entirely vindicated in my preparations twisting Pete's arm to travel all that way with me. Back to the Apache resort for a meal where the vibe was immense with everyone a story to tell about the day's challenges. The bridge near the finish could be seen for miles out but tried to avoid thinking about that as it wasn't coming closer. We passed the marina which went on for ages and I was shocked to learn I still had 1.6 miles to go in the complete darkness with no moon. There were stars everywhere for the kayakers to mostly enjoy. To avoid over-stressing about the finish I remember the Lynne Cox trick of counting in my head. I thought that if I could count to 1000 with each count representing an arm stroke of ca. 1 meter then I would almost be there. That 1000 count got me to the bridge. Pete and I stopped and said 'Wow' to each other for yet another time this trip just to try and take it all in. 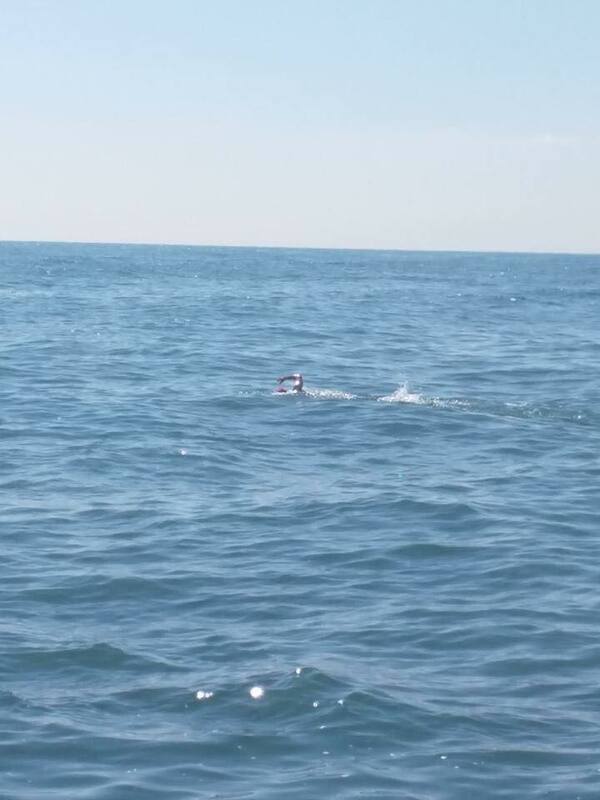 We then swam to the finish buoy line where we finished at the same time as Colleen from Scotland. We had both done it. Shaking of hands all-round and light applause from the boats. I think I yelled out 'yeah' a few times or something else completely non-sensical. It was 10pm. The whole adventure was over and I felt pretty overwhelmed to be honest. It had felt we were on a swimmers conveyor-belt for some of the 4 days trying ones best not to let the wheels fall off. The feeling of accomplishment hit me hard after checking into our hotel room in Globe and posting on Facebook. I grinned, took it all in and fell into one of the most contented sleeps I have ever had in my life. Magic. 1. You will be getting wet sitting on a sit-on-kayak. Some swims might make you feel very cold when you get to the end (despite the lush pictures). At the ends of Apache and Roosevelt, Pete was mildly hypothermic believe it or not. 2. Camelback is a great idea for feeding for paddlers and Pete's was filled with ice to help cool him on the warmer swims. Essential. 5. Sunglasses with leash - take 2 pairs of sunnies as one of Pete's broke. 8. Small tupperware box for Kayaker nutrition - Pete had dried fruit in his. 13. Jar to wee into during long swims for the chaps. Ensure you get enough width! 15. Pre-laminated and pre-routed maps of each lake. 17. Ensure to cover up shins as many kayakers had burnt shins. Also wear kayak shoes rather than crocs as they are more comfy. 18. Bring 2 pairs of kayak gloves as you will probably lose one pair somewhere. 19. Waterproof camera which you can secure to kayak using chord and carabina. 21. Binoculars. We forgot them and they might have been handy at times. 22. Mesh bag for all bits and pieces required during the swim for easy storage. 1. Plenty of factor 100 sun cream, Sudocrem zinc or Balmex which is the US equivalent. All the swimmers were caked in the stuff. Getting sunburn on your first swim might make the rest of it never happen. I use Coppertone Factor 100 spray AND cream which u can buy at Wal Mart. I used the spray first thing when getting up in the morning and the cream as a 2nd application before the swim. Then applied Sudocrem zinc on top. Worked a treat! 2. Vaseline or other for chafe etc. 3. Box of plastic gloves. $7 for 100 at Wal Mart. 6. Swear by my towelling dry-robe which you can get on line. Great for getting changed and boat rides, avoiding sun etc. 8. Crocs, hat, sunglasses plus hard case for sunglasses. 9. I used 2 whole tubs of maxim - without the generosity of Suzie Dodds I would have been left without in this department at Apache. Thanks Suzie. 11. LED lights like you would use for the Channel on costume and goggles. 12. We used a collapsable circular Thermos bag which was ideal. Can buy cool-boxes from Wal Mart that are disposable. 13. Small fluid thermos. End of Apache and Roosevelt you might feel cold. I had to feed off iced feeds which made me even colder. Cover that base with a small thermos with some warm drink just in case for those 2 swims. 14. The temperatures in the lakes were all around 70 fahrenheit. If you are from the UK and used to open water you will probably never swim outdoors in such hot water. That in itself can present its own challenges with overheating. Some US swimmers who were very thin complained about the cold water.....Trust me > it was mostly heavenly. 15. Could bring a mesh bag for feeds but we didn't need it as had the thermos bag. 1. We hired a Jeep Patriot which was ideal for the Apache trail plus had enough space for all our kit. 3. Choose your kayaker wisely. I would always take someone you know who is decent. Go the extra mile as they might go the extra mile for you on Apache which might make the difference between finish or failure. 4. Bring a flexible attitude and don't take anything (including yourself) seriously. We joked a whole bunch at every feed. 5. We stayed deliberately at La Quinta Inn at Superstition Blvd which meant that after the flight and drive we had 10 bars and restaurants including a good Mall and Wal Mart very nearby (all walkable). They also had a warm jacuzzi which was ideal for recovery after Saguaro. They also had loads of ice and fridges in rooms. 6. We did a fair amount of post swim recovery with milkshakes at Dairy Queen. Highly recommended. WE spent many lunchtimes at Paradise cafe in Signal Butte Road which serves the nicest salads and fresh value-added type nutritional food which we craved at times. They are all over Phoenix. This place is a real hit and you have to go. They will even pack you up a lunch at 7am. 7. Tonto Pass - you CANNOT buy these at Saguaro lake and have to buy them at Petrol stations etc in the area. Many people did not read the notes and could have been left stuck without the generosity of others. Buy 3 at the beginning of the week and you are covered for your parking. 8. Arrive early at swims as when things get moving you won't have time to breathe! 9. Insects by the lake were a non-issue. We only got bitten chilling by the hotel pool! 10. If your application is successful - READ ALL OF KENT's NOTES!! Many people didn't bother. Read them at least 3 times and have them with you. This is a tough swim. Make no mistake. I trained as hard as I could during the Winter but you can only do what you can with job constraints. My speed improved and I did 2 swim weeks away (40km in Lanzarote with Team Bayliss one week and another in FV) and loads of sets at Charlton Lido on Saturdays not to mention all the other gym, rowing and pilates work. If you look at those who finished and the times (on www.scarswim.com), you will observe that I was the last male finisher home in terms of aggregate time for all lakes. I don't necessarily consider myself the slowest but if you are contemplating this, then might be worth some definite consideration of speed! I think some of the media flannel was all about floating on your back and relaxation > don't be fooled - you still gotta be able to swim mileage. It's the hardest event in terms of the cumulative effect of 41 miles over 4 days I have done in my life. If I were to do each swim as a one-off event it wouldn't give me nightmares but this is definitely one of the hardest things I have done if not the hardest. The water temperature though was never cold to me but then I swam thru the winter with the Nutters in the UK! Lastly, don't underestimate the need for a decent kayaker. I wanted Pete to come along as I didn't want it round a stranger's neck that I might not finish the whole event. I won't put my name down again to swim as the event is niche and that might prevent someone else from taking part. Someone else needs to have this experience now. I would love to go back as a kayaker or to help on the boats with the volunteers. I would like to think that I will definitely return to take in the amazing scenery above the water. Happy swimming and get in touch if you need guidance and are thinking about applying.